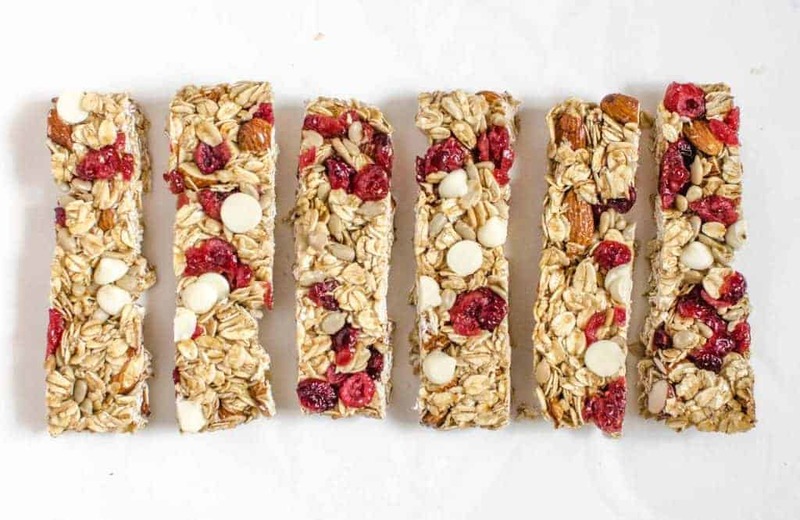 8 easy homemade granola bar recipes that come together in a snap. Variations include peanut butter chocolate, spiced nut, and cranberry white chocolate. 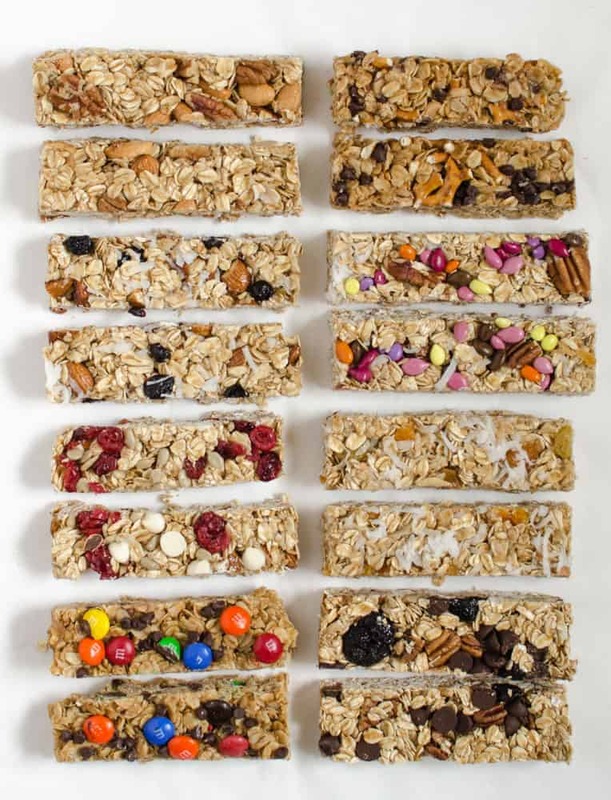 Have you ever made homemade granola bars? I did for the first time a few years ago to take with us on a trip to Yellowstone. They were delicious bits of heaven and I’ve been making that same recipe often for years. 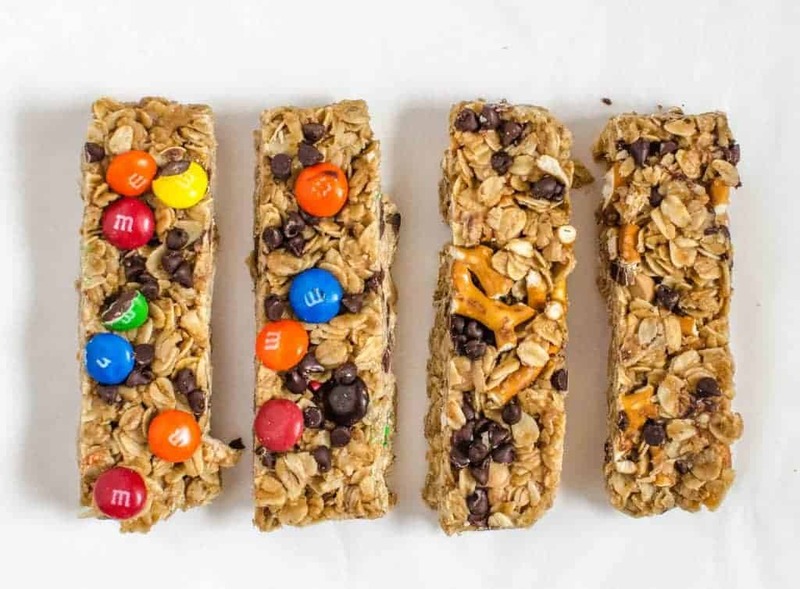 The other day I got a crazy idea to turn granola bars into one of my giant “# of this thing you should make” recipe posts and now I can’t be stopped! I have literally made granola bars at least three times a week for the last month. They are awesome! They taste delicious, they travel well, they make great little gifts to take over to friends, and they are just plain easy to put together. Need a snack for preschool, after t-ball, or to take in the car to a game? I’ve got you covered. I’m so excited about these posts because I think there’s a lot of power in giving you a lot of bang for your click. In other words, no matter how you got here, I want to make sure that you don’t go away with out getting some great information/inspiration. If you chose to click over to my blog I want to make your time worthwhile. So far I’ve done 8 no bake oatmeal energy bites, 9 date balls, 10 healthy snacks in a jar (you can make ahead), and 9 Staple Salad Dressings You Should Know How to Make (which is going crazy in Pinterest, hooray! ), and I have so many fun things planned. I’m so excited to share this post with you! I have spent so much time (and calories) getting things ready and you are going to love it! If this post speaks to you, you think someone else might like it, or you want to save it for later, by all means share it on your social media platforms. Pin it, facebook it, throw a picture up on Instagram and tag me (#blessthismesseats). All of those things are incredibly helpful to me and the more sharing that happens the more I’m able to turn this hobby into a job that helps my family (and my house building project). There is so much power in your sharing, you literally have no idea how important that is for me. Thank you! And now enjoy some amazing homemade granola bars from my kitchen to yours. Preheat the oven to 350 degrees. Line a 9-inch square baking dish with parchment or foil and lightly spray with cooking spray. Place the oats and nuts on a rimmed baking sheet and bake for 8-10 minutes until lightly toasted. Place the nuts and oats in a large bowl. While the oats are toasting, add the honey, butter, and brown sugar to a small saucepan. Cook over medium heat until the butter melts and the sugar dissolves, stirring occasionally. When butter mixture is ready, remove it from the heat and stir in the vanilla and salt. Pour this mixture over the oat and nut mixture and stir to combine. Add any extra ingredients (except for chocolate) and stir to combine. Make sure none of the oats are dry. If you are adding chocolate, wait about 15 minutes for the mixture to cool a bit before adding the chocolate and then stirring to combine. Place all of the oat mixture in the prepared pan. Use a rubber spatula or the bottom of a greased measuring cup to press the mixture into the pan. Chill the granola bars for at least 2 hours. Lift the bars from the pan using the edges of the foil or parchment and place them on a cutting board. Cut into desired shape/sizes and serve. The nutrition info was calculated with using almonds for the 3/4 of a cup of “mix-ins”. You can use 1/3 cup honey and 1/4 cup brown sugar in this recipe if you like a stronger honey flavor. The granola bars will be slightly more sticky this way. My kids did not like this ratio, though I thought it was great. The honey flavor was too strong for them. You can replace the brown sugar with honey and gently boil the mixture for about a minutes for these bars (stirring lots, honey burns quickly). The honey flavor was very strong but the bars held together. I didn’t really like the bars like this (too much honey flavor but when I used less they didn’t stick together). You can make the recipe as written and gently boil the mixture for 1 to 2 minutes and the bars will have a little more crunch to them and will be less soft/sticky. I’m 90% sure you could replace the brown sugar with coconut sugar though I haven’t tried it yet. I liked to press my bars down a second time after they chilled for the 2 hours. This really helped them to hold together well. These store super well in the fridge or freezer. If you are going to add chocolate, you’ll want to wait until the hot honey and oat mixture cools a little bit (about 15 minutes) or all the chocolate chips will melt (still tastes great, but doesn’t look as nice). Toasting the nuts and oats is optional but it makes the granola bars taste like cookies. I highly recommend it. You don’t actually have to put the oats/nuts in the bowl. If the pan that you toasted them on is large enough you can just pour the hot honey mixture over the top and carefully stir everything together right on the pan. It’s a little trickier, but I’d rather take a little more time to stir than wash an extra bowl. I feel like these are good after the 2 hour rest but I feel like they are really good after you let them sit overnight (this could be at room temperature if you are short on fridge space…). It gives everything time to blend and the texture improves, just FYI. I tried a batch with coconut oil in place of the butter and it turned out great though they seemed to not hold together as well. Here are my 8 variations. You’ll follow the directions in the “master mix” recipe but I have specified what nuts and add-ins to include. The possibilities are endless but here are some of my favorites! Notes: I’m obsessed with dried blueberries right now! You can get really tasty ones at Trader Joe’s (they were soft and squishy and did come with added sugar), and I also bought a bag of unsweetened ones from Bob’s Red Mill online and had them mailed to my house. These were very hard but still delicious. In an effort to soften them up a bit I tossed them in the butter mixture on the stove and let them sit in the hot liquid for about 10 minutes which worked fine. You can use traditional shredded sweetened coconut or you can buy shredded unsweetened coconut, both were delicious, though I like the texture of the unsweetened coconut better. Notes: The toasted pecans in the granola bars were my favorite. If you are going to use pecans don’t skip the toasting step because it makes them amazing! I have bought dried tart cherries, dried Bing cherries, and dried “sweet” cherries recently. They are all delicious (again I got some at Trader Joe’s and the tart cherries online from Bob’s Red Mill). I liked the tang of the tart cherries the best but any will work really. I got all of the dried fruit at Trader Joe’s and it was all so delicious. I’m sad my dried pineapple is all gone. You can use traditional shredded sweetened coconut or you can buy unsweetened coconut, both were delicious, though I like the texture of the unsweetened coconut better. These were classic, traditional, and good. Plus, the red from the cranberries are really pretty. Notes: Did you even have those “Kudos” bars when you were a kid that were practically an oat candy bar? These taste just like them. I used both natural and traditional peanut butter with success. The addition of a few peanuts would be delicious though I didn’t try it. Notes: these fell apart a little more for me (from adding the pretzels I assume, they must soak up some of the moisture faster than the oats do), you can add an additional 2 tablespoons of butter to the honey mixture to add a little more moisture. Notes: The additional of cinnamon and all those perfectly toasted nuts was awesome. Notes: The candy coated sunflower seeds are really pretty and I liked using them, but they actually don’t taste all the great (they don’t have any chocolate). After I made and ate these I wanted to go back and add either 1/2 teaspoon of cinnamon to the butter mixture OR some chocolate chips (maybe white chocolate chips?). They needed a little more going on. You can use traditional shredded sweetened coconut or you can buy unsweetened coconut, both were delicious, though I like the texture of the unsweetened coconut better. This recipe is adapted from and inspired by What’s Gaby Cooking. 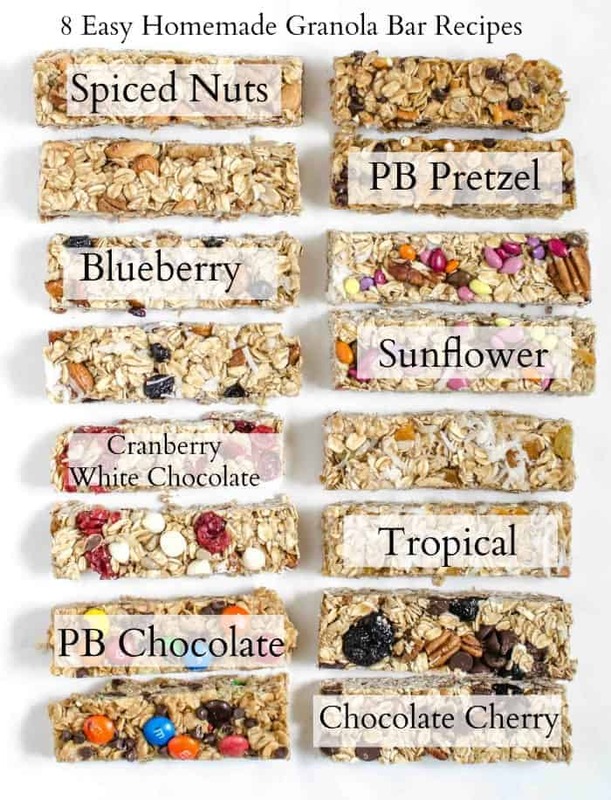 Which granola bar recipe will you be making first? Here’s one last combo because it’s my current obsession – the master mix with pecans (toasted, you have to toast the pecans!) with dried blueberries and a little bit of cinnamon thrown in. You guys, it tastes like a berry crisp and I’m not complaining. It’s so good! You have a million and one options (with 8 solid recipes to start with) and I know at least one of them spoke to you heart (or stomach) today. Sign up to receive emails from Bless This Mess and get a FREE copy of 8 Homemade Granola Bar Recipes. I’d just skip them all together and not worry about adding more oats, the nuts wouldn’t have soaked up any of the moisture really so I don’t think it’d me an issue! Let me know if you try it, I’d love to hear how it works. Sounds delicious, thank you for the suggestion. For a nut Free version, you can replace nuits bye seeds (pumpkin, chia, sesame, sunflower, hemp, etc).I always transform the recipes to adapt them for school. Has anyone tried making this with just the honey and no brown sugar? Yep, I put it in the notes/bullet points in the post, did you see it? All honey needed to simmer (super low and slow though because honey burns quickly) to cook the sugar just a bit so that it would be a little stickier and stick together. Also, it was very strong in the honey flavor and we didn’t like them very well. If you adore all things honey you might, but if was super strong. If you are looking for a more natural sugar route I’d try coconut sugar in place of the brown sugar! Do they stick well with just honey? Do they come out hard or soft and chewy? They stick fine but it was too strong of a honey taste for me kids to like them… that’s the only issue with using all honey. I made the original recipe using almonds and cranberries but I used syrup in place of honey only because that’s what I had at home , they turned out so well. If making with peanut butter. Would that replace the honey? I’m excited to make this for my child’s preschool, since parents take turns making snack for the kids. I love all the ideas! My 14-year-old daughter made a batch by herself, and they’re super yummy! She did a 1.5 recipe to go in a 9X13 pan, and those dimensions worked out well. She added roasted almonds and dried cranberries. They hold up really well – thanks! Would you be able to use applesauce in place of the butter? I don’t think so. You’d be better off trying it with coconut oil! Yummy! We are trying these. I only have a microwave, do you know how I might be able to bake the oats and nuts using a microwave? Mine’s a basic microwave (hi, mid, low settings), there is no convection option. Hmmmm, that’s a great questions. I really don’t have much input for you but I think it would be worth trying a batch on maybe low? Let me know if it works for you! Slow roast nuts and oats in a fry pan. No microwave or oven needed. Just made a batch using pretzels, coconut, almond butter, almonds, pistachios and chocolate drizzled on top after they cooled. SO GOOD! Thanks for the great recipe–I’ve had lots of trouble with bars falling apart on past attempts but these were great. I’ve made these a couple of times just using a fridge to set them, but I am going for a trip, and I won’t have access to a fridge to store them. I’ve tried keeping them at room temperature before, but they always fall apart. Do you think I can perhaps bake them for a short time to bind the ingredients together, so they’ll hold together at room temperature? Love the recipe by the way – SUPER DELICIOUS! I do think you could bake them, maybe at 350 for 10 minutes? I think your other option would be to let the sugar mixture come to a light boil for maybe 1 minute. If you cook the sugar a bit on the stove I think they would firm up once cooled too. I’m so glad you like them and I can’t wait to hear about any adjustments you might make. These were absolutely delicious! Like, amazing! 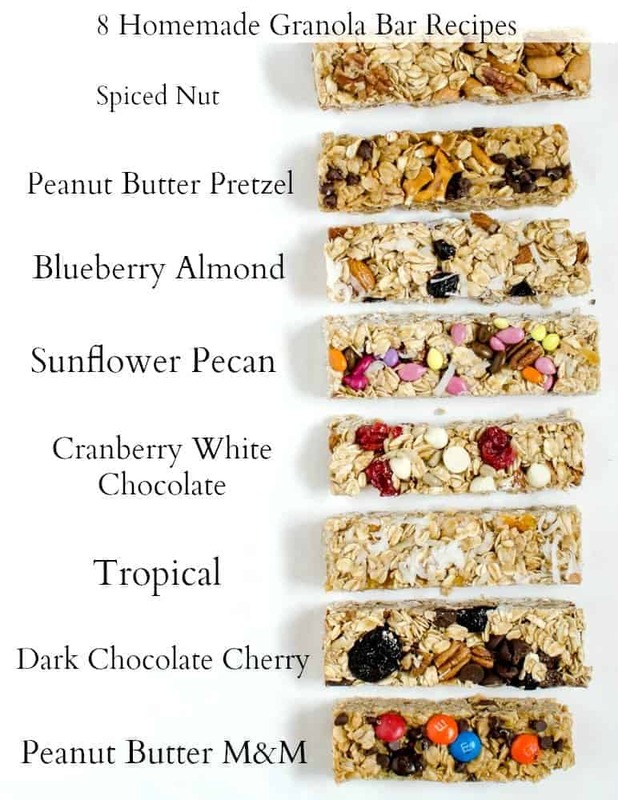 I have tried a couple of other granola bar recipes and these were defintely the best. They tasted great and the texture was perfect. Thanks for all your work to get these just right! No butter, subbed PB. Added 2tlb milk to thin out mix from PB. Oven-dried strawberries and bananas, cornflakes, chocolate chips, mixed (unsalted) nuts. I also added cinnamon, and a little pink Himalayan sea salt. Delightful! Thanks! I’ll be making these again. I have been looking for a good granola bar base recipe and this is it. I am feeding the cross country team each weekend when they travel and this recipe is perfect. I added almonds, pecans and walnuts to the base and then add extra flavors beyond that. The kids love them and so does the coach. The kids are now making flavor requests each week! (No nut allergies, obviously…). Thank you so much for the great ideas. I love that! Thank you so much for sharing. We make them lots and lots for school snacks and team sport stuff too. Thanks for your comment, totally made my day! WHat size pan for these? A 9 by 9 inch square baking dish is what’s called for in the recipe. A double batch works great with a 9×13 inch pan. I just made these with the M&Ms, chocolate chips, and PB. I had saw that someone 1.5’d the recipe for a 9×13 so I did that. They didn’t cut into nice shapes and the M&Ms all fell off! Now I see that I should have probably doubled it. Do you think that doubling it instead would fix the crumbly not-holding-together issue? I’d double it for sure. Also, try cooking the the sugar mixture on the stove just a little less, that might help it not crumble too. How did they taste?? Is there a certain amount of time to cook the sugar mixture? Taste pretty good…wish more M&Ms would have stuck ? Is there a certain time to cook the sugar mixture? Tasted pretty good…wish more M&Ms would have stuck ? These are so good! I made the peanut butter pretzel ones and I did dried cranberry, coconut and almonds and the last one I was channeling an almond joy and did almonds, cashews, coconut and chocolate ?. So yum! Those sound so good! Thank you for sharing! I can’t wait to try your Almond Joy combo, so tasty. These are a perfect on-the-go snack! Plan on making some of these to keep around the house or throw in my gym bag. Can’t wait to try the endless varieties! How about making these for a vegan friend… if I sub earth balance for butter could I swap the honey for agave or other sweetener? I am not familiar with adjusting for vegan cooking. Thank you! I’d do coconut oil for the butter and agave or maple syrup for the honey (though the agave is closer in texture to the honey, so maybe try that first!). I’d love to hear how it goes! These. are. amazing. Period. I have tried countless granola bar recipes and never had any as good as this. No problems with crumbling either and I kept them at room temp. We took them (double batch) on holiday last week and they were supposed to last all week but only lasted about 2 days. I could eat a whole batch myself in one sitting. My problem is that I actually need to make them taste LESS good cuz I couldn’t stop eating them! Kids loved them too. I did a double batch and put them in a high-rimmed cookie sheet. It was perfect. Making more tonight for this weeks lunches–if they make it past Tuesday! Best review ever. Thank you so much for taking the time to leave a comment. We love them too! Happy granola bar making friend. I’m making these now in a gluten-free version & the “dough” tastes great! (Peanut craisin chocolate chip and almond craisin coconut). I’m wondering if you have tried to make granola clusters with this recipe??? can’t wait to try these for our upcoming trip as snacks for the boys. Can you replace the honey with maple syrup? It might be a bit too runny. Also going to try nut free when we back as the school is nut free. I think if you use maple syrup you’ll want to use something like flax meal of chia seeds to help everything stick together more but I’d play with it, I’m sure you can get it to work! And yep, sunbutter works great for a nut free option! Love this! I am totally going to make this a regular snack for our family. It’s so good. I try recipes out all the time and more than half the time, the recipe isn’t actually that great and it’s a total let-down, but these turned out perfect! I used gluten free oats from Trader Joe’s. For my extras I used Trader Joe’s gluten free coconut granola, more coconut, dates, cashews and sunflower seeds. I used coconut sugar instead of brown sugar. I used a little more than what’s called for with the brown sugar because I find the coconut sugar to be slightly less sweet. Anyways, they turned out amazing! These look awesome!! I have a question. I’ve done no bake granola recipes before and it seems like you have to remove them from the refrigerator and eat them right away otherwise they become kind of ‘melted’ I need to bring these to a friend’s house in another state. How do I do this? Should I get to my friend’s house and say these granola bars have to be refrigerated for 2 hours before consumption? I feel like when you bake the bars they stay together better but not sure if I can bake these. Is there a reason for baked vs no bake? Just wondering. Thank you in advance! It’s all about how much you cook the sugar! So for this recipe if you boil the sugar mixture a full minute to 2 then it’ll stick together better than if just you let it come to a bubble. Try that. I just made these last week again and let it boil a minute and they were the perfect stick together but not be hard consistency. Try them! I just put them in the fridge to cool them before cutting them they don’t need to stay there and will be totally portable. Also, make sure you give them a good press in the bottom of the pan with the bottom of a cup or measuring up, that’ll help everything stick together better too! Thank you so much for your reply!! I will definitely try what you said. I am currious to ty the colored sunflower seeds. They make your bars look so pretty! I actually got them at Joanna Fabrics on a whim and haven’t found them since! I bet somewhere like whole foods or Trader Joes might have them. Ok are you using dry measurements for the dry ingredients or are you using the volume cups? I made these with dried blueberries and pecans and local Swarmbustin’ honey. They were AMAZING ! Thanks for the recipe ! I do sell it at the farmer’s market. Shoot me an email and we can work something out! Absolutely delicious! This was my first attempt at homemade granola bars and I followed the recipe exactly. For addons I used orange flavored cranberries and white chocolate chips. I did bake the whole thing for about 6 minutes based on one of the comments. A keeper for sure. Thank you! At the beginning of the recipe instructions you mentioned to preheat the oven to 350degrees. Then later you said to pour the mix into yhe prepared pan but you didnt mention baking the mixture!! Do you actually bake it or just refrigerate it? 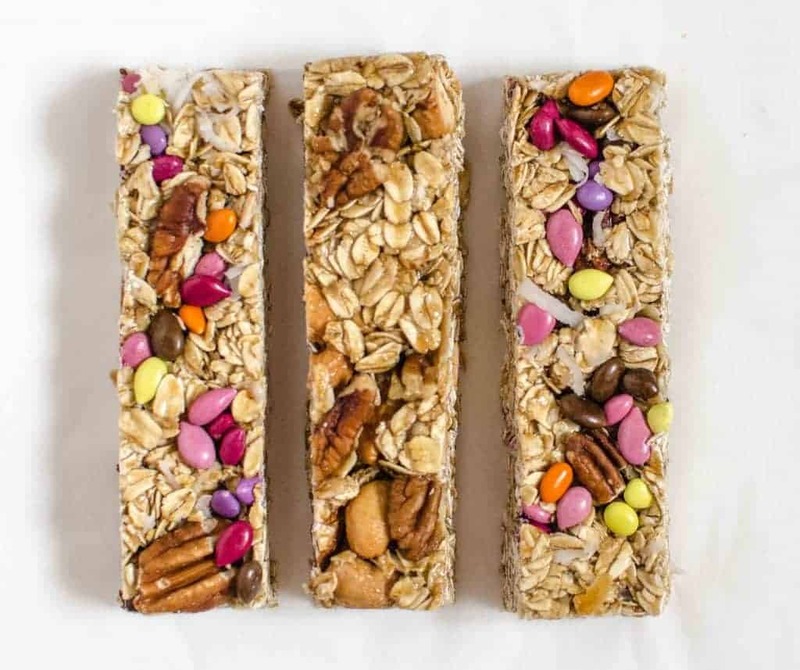 Hello tried these granola bars, but they are falling apart even after refrigerating them overnight….Can you please suggest a way out to make them stay together…They are perfectly sweet so adding more of honey would make them sweeter please help to survive the batch..
Hi! i love these bars! Ived tried alot of recipes and this one hasnt failed but i just wanted to know instead of coconut oil could you be able to use vegan butter to make it vegan? I haven’t used a lot of vegan butter before but I’d try it! I thought coconut oil was vegan though? Is it not? I loved these they were delicious.To make them stick together better you said to boil the sugar mixture for 1-2 minutes,is that with or without adding the honey as will it not burn. You can go ahead and add the honey, just stir well while cooking! After cutting, wrap individual pieces in wax paper, easy to transport and use. Hi, I’m curious if this bars are okay to send as a care package (mailing from CA to Mi) for my college daughters? Yep, these are a great option to ship in sturdy packaging! Instead of using honey, what other ingredient can I use? I’d try agave or brown rice syrup! oh my god..so many varieties, I could imagine just one but looking these many, I am going gaga. Hope to try few of them soon. These are great. My entire family loved them….easy to prepare and relatively quick. I don’t understand the nutrition info. Is it really 300 calories per serving? Did 1/3 honey and 1/4 brown sugar ( doubled), but would reduce honey too 1/4 next time, had a tiny bit too much liquid which settled on the bottom of the bars when chilled so I think I could scale it back a bit and make them less sweet. I did mine with only chopped almonds, so this could have accounted for the extra liquid and then pressed it in the pan, let cool 15mins, sprinkled mini m&ms and pressed again quickly before they got mushy – looked great but the m&ms didn’t stick great- chips this way probably would have worked better. I also had to do 1/2 margarine, 1/2 butter as I ran out of butter, and forgot the salt so I sprinkled it on while waiting to cool for the chocolate, but neither appeared to effect taste, delish! Thanks for all of the tips Renee, I appreciate that! Forgot to toast the oats, can i bake it after the cool down. You won’t need to toast it if you already have them into bars, just skip it this time, they’ll be fine! Can i uss steel cut oats? Nope, because they aren’t really getting cooked, I think they’d be too hard/chewy in the end. They look super good and it’s been a long time since I’ve found this fantastic recipe… I’m not sure about what to add but still I’m sure it will be delicious. Do you think I could use freeze-dried fruit? Yes, freeze dried should work just fine! love this recipe thank you! I used coconut oil and brown rice syrup in place of the butter and honey and its great. They don’t hold together in bars but more like clusters so I just use this recipe for granola for my yogurt parfaits. So delicious! These are delicious! I made a double batch. One for us, one for a friend who just had a baby. I added almonds, walnuts, sunflower seeds, chocolate chips, and dried cranberries. I also used coconut sugar in place of brown sugar and coconut oil in place of butter and added a few shakes of cinnamon. So, so good. 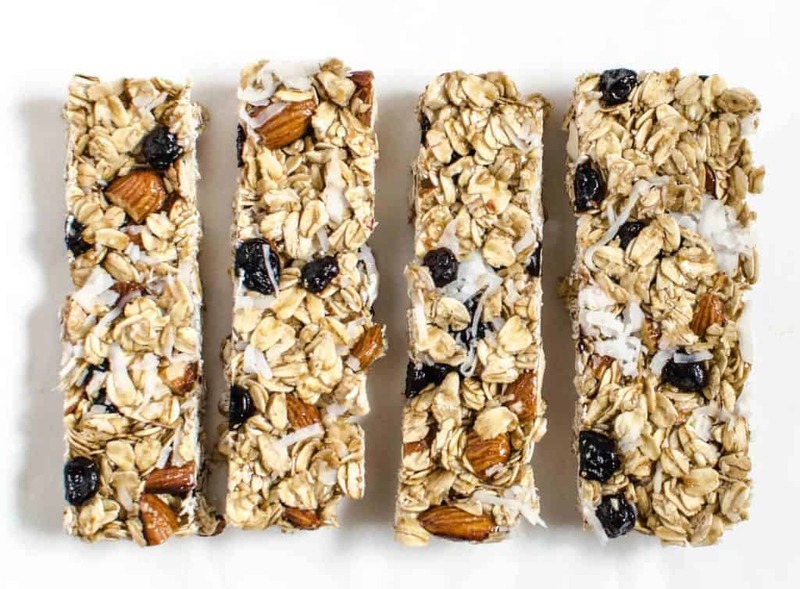 I’ve been searching for a granola bar recipe for my husband and sons to take to work with them that was made with healthy ingredients, tasted great and didn’t fall apart. Not too much to ask, you’d think… However, most of the recipes I’ve tried resulted in either a sticky mess or just wouldn’t hold together. I just made these about an hour ago and I can already tell they’re are going to hit all marks. I let the liquid boil a couple extra minutes to get a slightly firmer bar and they started setting up nicely by the time I poured the mix into the pan. The flavor (of course I had to sample) was wonderful- perfect mix of honey and brown sugar – but not overly sweet. I used toasted almonds for the nuts and Trader Joe’s dried cranberries, raisins and blueberries. I think my search is finally over! Thank you! We’ve made these several times; raisin and coconut, then peanut butter and chocchip, and today date and coconut. All delicious. Great recipe. Thank you for the recipe. Just wondering if instant oats can be used instead of rolled ? Yep, it’ll work great! Slightly different texture but if that’s what you have on hand I’d use it! I made them today and they are great! Love the recipe! I used master mix+almonds, than 1/4 cup walnuts, 1/4 cup pistachios and 1/4 cup dates. Instead of brown sugar I used a coconut sugar and they turned out perfect. They sound perfect! Thank you for sharing your recipe, can’t wait to try it! I am so excited to try these! I just found your recipe today. I see that you don’t need to bake yours after putting them together but I am curious why most others do? Is there are reason? Just curious about the difference. Thanks again for sharing the recipe. I am planning on adding pumpkin seeds, dried tart cherries, and dark chocolate chunks. Because you are cooking the sugar on the stove, you don’t need to cook it again in the oven with everything else. My husband requested that I make these every week for him. He loves the m&m peanut butter granola bar. Thank you for sharing this recipe! The master mix calls for 3/4 cups of extra mix ins at the end. Is this in addition to the additional ingredients for the special bars listed below? Nope, the ones I listed below are what I’m referring to as those extras. Feel free to change them up as you like! Great recipe. Everyone devoured the first batch I made last week so I’m making a double batch this week. Great quick snack. These look great. Would it still work if I replace half the rolled oats with rice crispies? Yes! 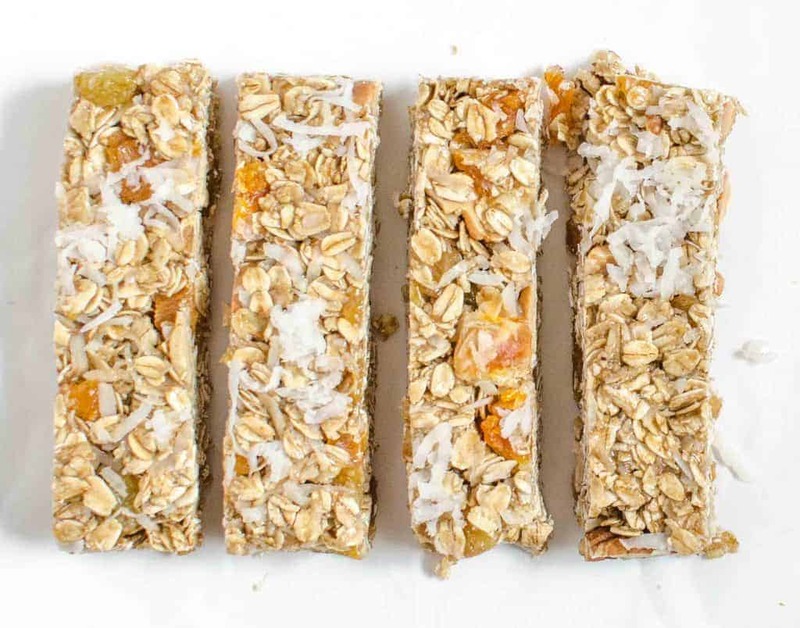 One of my favorite tricks for light and fluffy granola bars! Hey, can you make these nutfree by replacing the nuts in the master mix with sunflower seeds? How well do these last in a vacuum sealed pouch unrefigerated? I think they’d be fine about a week. Its such a fabulous recipe i tried it n i loved it and my hubby loved it too n now almost every 15days hez behind my life to make a new batch lol which i love making for him.. n this is all possible coz of u bec the recipe u mentioned is just too perfect n so easy to make plus ur extra mentions as to how to make it easily is just excellent..thank u for posting it..i super love it..
Also please i just wanted to ask that if i store in refrigerator overnight and then the other day carry it on my travel flight which would be about 12hours to another country will it be still proper or will it catch mold or will it become soggy?? They will be great on a plane! The fridge just helps for long term storage but they are just fine out. They won’t get soggy or mold in that short of a time. Corn syrup, brown rice syrup, and even a brown sugar with a bit of water or molasses will work! Enjoy! These are awesome. I made the spiced nut bars and added 1/4 cup toasted buckwheat-soooo yummy and added a lovely crunch. Where did the prepared pan come from as instruction 5? Thanks so much for these. I am going to experiment with tweaking them to my own tastes. I’m diabetic, so I’m going to try making some dark chocolate cherry ones with a healthy, homemade honey-sweetened dark chocolate coating the bottom instead of using chips. Wish me luck! What can I substitute pecan with for spiced nuts granola? And should we toast the cashews for the same? That would work great! Any nut you like really. I have to leave a comment after visiting this recipe 4x in the last 3 months — thank you for posting! I’m a new mom, and I’ve been modifying these (added flax seed, etc.) in place of lactation cookies because these bars last so much longer than cookies. I wrap them in foil and leave them in bowls in my ‘nursing stations’ throughout the house, and they’re *great*! That is SUCH a great idea! Thank you for sharing and congrats on your baby! I’ve made these twice now and they were a big hit! Thanks for such a no-nonsense recipe! Way to co Kathleen! Hope you love them friend! Thank you for this recipe. I tried it recently for the first time with my 3-year old child, as I was looking for ways to continue to enjoy them without using foil wraps. We enjoyed making it, and when the bars were ready to be had, they didn’t last long! Love making these! They’re much better than the ones at the store. We like to replace the nuts with our favorite crushed cereals – shredded wheat and chex work well, but I’m sure you could use anything! That is such a fun idea! I’m going to have to try that next time, thank you for sharing that! Fantastic recipes! OK – you seem very creative! Challenge – any suggestions for making the bars vegan? I prefer to stay away from sugar and don’t mind if they are not sweet. Also, I prefer not to use honey due to the whole vegan thing (as well as butter). YES! Hard to think about. But if you can come up with something, your business will grow even bigger! I will share your site with everyone! I’m sure we could figure something out by cooking maple syrup and coconut oil! I’ll work on it for you! This recipe sounds delicious! But how would they hold up for a toddler? In the past, the recipes I’ve tried have turned out to either be hard as a rock or far too crumbly. I need something that he can grab and eat (preferably that can be stored in a diaper bag for a few hours) without leaving millions of pieces behind. Also, if I wrap them individually and then freeze, would these last for 2 or 3 months? I have 5 kids and we LOVE THESE! I know just what you are talking about. Conventional granola bars are band from our house because I cannot handle the crumbly mess they leave everywhere. You will love these, they turn out great, stay together, if you are adding fruit or nuts chop them up so your toddler can chew them well (and when the pieces are more uniform in size, the bars stay together better) and then cut them into smaller pieces too. I will cut each bar in half again so that they are essentially half a granola bar. And yes, they keep super super well. I can’t wait for you to love these as much as we do! I’ve made several variations using this base mix and they were all delicious! Definitely have to wait before adding chocolate or peanut butter chips if you want pieces of them and not have them melt (both ways taste good) 🙂 excellent base for any kind of granola bars. Thank you for the great review and tips! It was delioush and a lot of my friends liked it! ;)!! I have been making these granola bars for my family for 2 months now. It is my daughter’s go-to snack for school and my hubby’s fave munch before hitting the gym. Thanks a ton Melissa- these taste absolutely heavenly, not to mention how wonderfully healthy they are! Thank you for taking the time to leave a review, so helpful! I’m glad you love them as much as we do. These were a little too sweet for me. Can I reduce the sugar or honey without ruining the consistency? I make these every week for my family. I always use peanut butter and add nuts, chocolate chips. My fiance think I’m incredibly wonderful for making homemade granola bars for his lunch. Thank you for the amazing recipe. That’s so awesome! I’m glad you all love them as much as we do, ENJOY! I doubled the recipe for the basic recipe using almonds and dried cranberries. I may have used a little over the 3/4 cup of cranberries. They were very good except too sweet for my taste. I will make them again, cutting back on the cranberries and brown sugar. Excellent basic recipe! Thanks. You probably just have too many additions to your oats, try adding a bit less of increasing you honey and butter by a few tablespoons. So glad you could tweek it to what you needed and that it worked out great. Happy lunch packing mama! Damn you! These granola bars are soooo good I can’t leave them alone! My hips won’t thank you but the rest of me loves you. Bahahaha I get you friend, I get you! Why preheat the oven if the bars are not baked only chilled?? That was for toasting the nuts and oats if you like. Will quick oats work the same as the rolled oats? Don’t have much experience baking with oats. Sorry if this is a silly question! Sometimes the quick oats will also be called minute oats. They are just cut a little smaller than the rolled oats so the texture is different. You can use either one, it’ll just hold together a little different and the texture will be a little different. Can I use corn syrup instead of honey? I am allergic to honey. I do think it would work just great, let me know! I’d love to add that to the notes! These sound perfect for my dayhome!….Can you substitute the honey for Corn Syrup? ?I have a child allergic to honey. Yes, I think that would work just great! Let me know if you try it so I can let other people know too! These are the best. I add maple syrup, cinnamon, and raisins for my husband’s bars. I toast pecans for mine, and the kids have a field day will their variety of mix-ins. I do have a question since my oldest doesn’t like nuts. Is there a sub for nuts or could I make it without the almonds for the same taste? I’m worried about the texture though. It’ll work great with or without the nuts, no issues on leaving them out! Your recipe says it serves 16. That would make very tiny bars. I watched your video and see you only made it into 12 servings. We cut the butter by half, used truvia brown blend, subbed sugar free pancake syrup for the honey, and threw in 2 scoops of whey while we were at it. It gets the calories down (PER 12 BARS) to 190. OOhhh! Thank you for sharing your substitutions with us to make them nut-free, super helpful! Made these and they crumbled into granola instead of a “bar”. I followed the directions as stated and do not understand why they did not “stick” together. I went to the internet and found out that this is a common thing, what could have went wrong? The taste is beyond amazing just didn’t get that “bar”. You were probably just a little more generous on your measurements for dry ingredients and additions “extras”, just up the honey/butter/brown sugar by a tablespoon or so each next time or add less oats! Hi, I just read your first recipe listed. It is what I’ve been looking for. It is healthier than I thought it would be too. I will try it today and I’ll be back. Perfect! I added 1/2 cup of pumpkin seeds (the kind for baking), 1 tablespoon flaxseed and 1 tablespoon chia seeds. I can’t wait to try more variations! Loved it. Your additions sound wonderful, can’t wait to try them myself, thank you for sharing! intolerant )and I wonder if adding a small amount of psyllium and whey isolate protein powder would work. I would need to replace the honey with maple syrup and carefully choose additions). Thanks! I don’t know for sure but there are some free online options for calculating nutrition info that might work really well for you! I think you could definitely play around with the recipe to get the results you need! I want to thank you for all the yummy recipes. I will be making the Dark Chocolate Cherry bars (using tart cherries of course) and a little change up on your Cranberry White Chocolate bars. I’m going to use Dark Chocolate (a little healthier I think). Well, I must say I was emotional unprepared for how AMAZING this recipe is. I’m seriously blown away. I’ve been eating crap granola bars from the grocery store this whole time and this recipe has been out for YEARS? This will be something I make in my house every week for the rest of time. Melissa – my family and I can’t thank you enough. Hi there. After my husband found your recipe a couple weeks ago, ive just now made a batch. Weve been looking for recipes like this in order to give our kids more real food. It took a while to get ingredients all in the pantry at one time. Were just not used to stocking these items on our tight budget but i finally got em. I made it with just raisins and fingers crossed the kids love it tomorrow. Welcome! How did the kids like them? 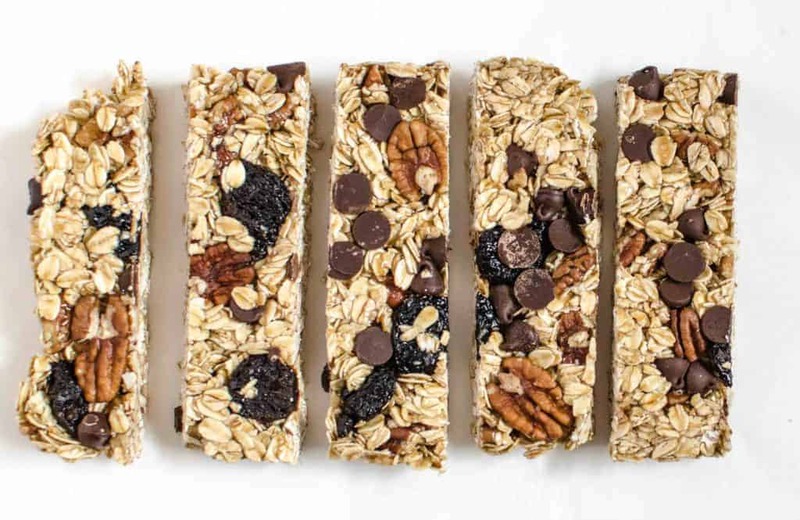 My kids always prefer chocolate over raisins but you know… kids 🙂 I on the other hand love all of the fruit granola bars! Hope you all did too! Thank you for this! My son (3.5yrs) and I decided today was a good day to make some granola bars to have on hand. We absolutely LOVE all of your energy bite recipes – we call them nut balls and ALWAYS have a big bag in the freezer for quick snacks. 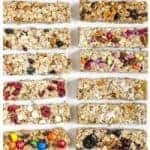 When we found this granola bar recipe and variation on your site we knew this was the granola bar recipe for us! LOVE this comment! Thank you! Which one did you choose and how did it turn out?! Thank you for taking the time to come back and comment, that really makes my day. I made these with a base of cashews and rolled oats and the following mix-ins: dried tart cherries, dried apricots and a muscat/golden/red flame raisin mix. The total calorie count per bar was a whopping 345 or three times that of a commercial bar. However, sharing one with my husband following a 30 mile bike ride was well worth the caloric overload! (I would vote for a Snickers at 250 calories next time). For Christmas I used this recipe to make “stocking stuffers” for everyone in the family. I tripled the recipe and loaded the bars with a variety of “add-ins”. The bars were so scrumptious and popular that I have not stopped making them! Guess what everybody got for Valentine’s Day! Thanks!! Now that’s the kind of gift I want to get for Christmas and Valentine’s! Such a great idea! Thanks for coming back to leave a comment! I love this recipe. I use Rice Krispies instead of nuts. Has anyone found a good way of using maple syrup instead of honey? I tried it but the bars didn’t stick together. Thanks. Um first of all these were DELICIOUS! I’ve been trying to find a suitable recipe to replace our grocery store granola bars (they’re so expensive! And go too fast in a family of 6) Tip for using chocolate/m&m’s/anything that melts: freeze your chocolate first! It prevents melting when stirring into the warm bar mixture so they hold their shape. Thank you for the recipe! We loved it! Whattttttttt?! You officially blew my mind. That’s SUCH a great idea! Thank you for sharing! Just made these for the first time on the weekend. They were a big hit by all! Wanted to share that I used coconut sugar instead of brown sugar and was happy with the results! Bars held together and taste great. Thanks for this amazing recipe! Thank you for the tips and tricks! It’s so great to know what worked well for other people. can i completely eliminate the sugar? will the bars still hold? I haven’t tried it! Are you thinking of omitting just the brown sugar or the brown sugar AND the honey?